I met Naomi when I went to see a taping of a show about using art as therapy. She was one of the panelists and she spoke of her organization paintbrushfire.org which leads painting workshops that help people connect with their creativity. When she heard of my project she was excited and she soon emailed me several interesting ideas. 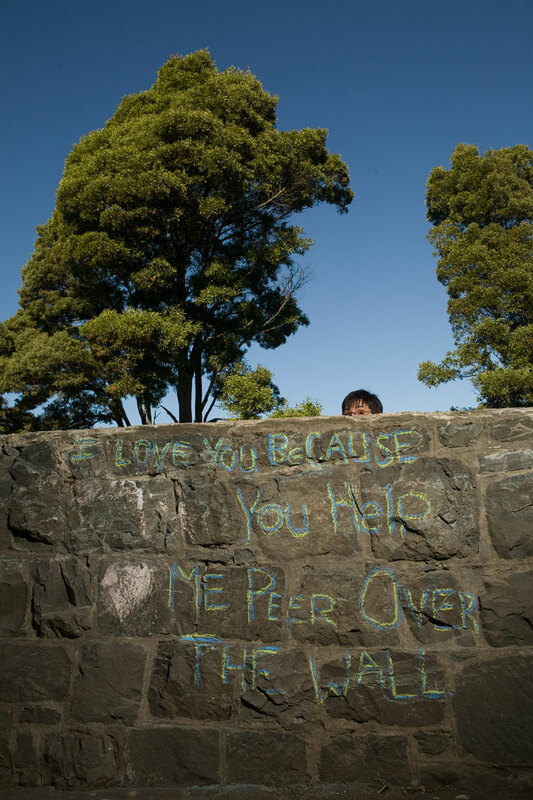 The one we went with, “I love you because you help me peer over the wall,” expresses her love for her partner who, over the last eleven years, has consistently given her love and acceptance. This has allowed Naomi to come out from behind her metaphorical wall, one she put up early in life to protect herself. In talking with Naomi, I got a sense of how far she had come with the help of her partner’s love. It is clear that Naomi feels she is the luckiest woman in the world. She lit up and smiles came across her face as she recalled their meeting and subsequent slow courtship. Naomi told me about how loath she was to go on their first vacation together — she almost backed out — but her friends pushed her to go. Since then there have certainly been occasional hard times but overall they have grown and changed and are still together, loving each other. For me, Naomi’s story illustrates how scary love can seem. Maybe we think we don’t deserve love or maybe we’re worried about what will happen if we let someone in. But somehow, love finds a way to sneak in and our lives become immeasurably brighter. It is clear that this is the path Naomi’s life has taken and it warmed my heart to see her so happy and full of love. Click here to see a portrait of Naomi.